You'll be £12.99 closer to your next £10.00 credit when you purchase One-hour Wargames. What's this? 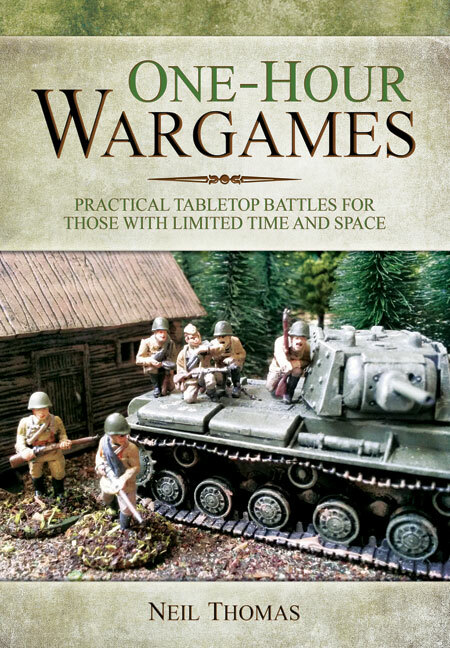 The book contains 8 (all-new) sets of very simple rules for various periods, from Ancient to WW2 and 30 scenarios which can be played using any of them, so you don't even have to take too much time thinking up a stimulating tactical situation and objectives. All the rules and scenarios are intended to be played on a 3ft x 3ft battlefield. The rules only require a small number of miniatures, so this really is an ideal way for new gamers, or veterans trying a new period, to get started with minimal investment of time and money. Also ideal for a quick game in the evening when a friend pops round. There are also sections on campaigns and solo games. A well thought out book, aimed at getting enjoyment from your hobby in a way that can be fitted into family and working life. Quite simply, this is a well thought out, most inspiring book - all credit to the author for an excellent addition to the wargaming library. Highly recommended. An ideal introduction to wargaming with miniatures for youngsters. One-Hour Wargames certainly achieves its stated aims and is excellent value.